The market outlook for 2016 presents significant challenges and opportunities that we have not seen for 40 years. Since I began work on creating our first bullion fund in 1998, I have generally restricted my commentary to using precious metals for strategic portfolio allocation. Everyone agrees that investment portfolios should be diversified. Since gold is the most non-correlated asset class to traditional financial assets it provides important portfolio diversification. A strategic allocation of at least 10 percent reduces portfolio risk and improves returns over the long term. This year I’d like to discuss a tactical opportunity, a market disparity that exists because of an artificial low in the gold price, and an unsustainable high in financial assets. Everybody understands buy low and sell high. The opportunity for 2016 is to sell high, buy low. Many Canadians have profited by investing in U.S. equities since 2009 and, since 2011, they have also received a 32 percent bonus, because the Canadian dollar declined against the U.S. dollar. 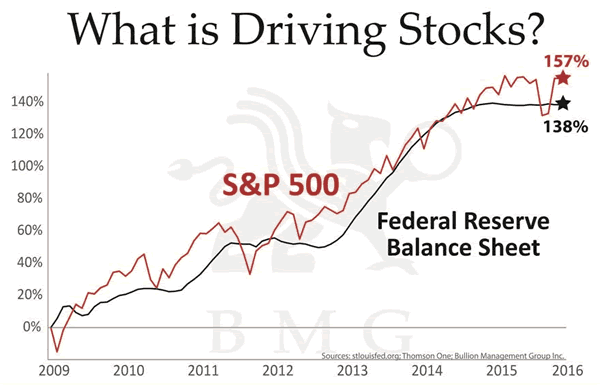 However, this rise in equities was largely a result of the U.S. Federal Reserve increasing its balance sheet. The monetary policy of low interest rates resulted in trillions of dollars in stock buy-backs and mergers, using low-cost borrowed money. These monetary policies on the part of the world’s central banks have caused bubbles in stocks, bonds, real estate, art, and exotic cars. These are not likely to continue higher in 2016, and the risk of a major correction looms. In 2000, we had the tech sell-off that no one expected. Eight years later, we had the subprime sell-off that no one expected. In 2016, another eight years later, we will likely have an equity sell-off as global economies contract, and geopolitical tensions rise. While it is clear that the global economy is contracting and there are numerous vulnerabilities, several valuation methodologies summarize current market fundamentals and provide an excellent indicator of future trends. They are the Buffet Indicator, the Shiller PE Ratio, and the Tobin Q Ratio. The Buffett Indicator uses the total market capitalization of U.S. equities divided by GDP. 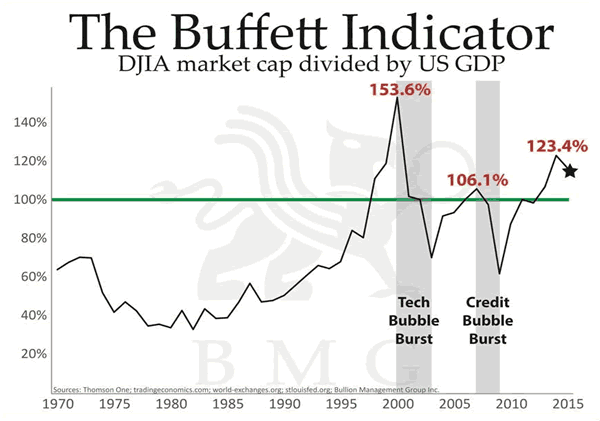 The only other times the Buffett ratio exceeded 100 was just prior to the tech crash in 2000, and the credit bubble in 2008. 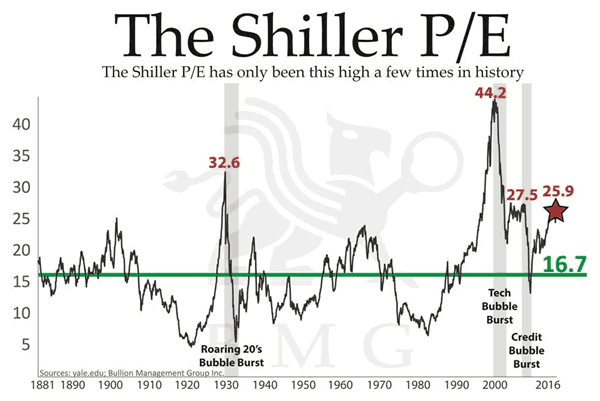 The Shiller PE is a popular indicator of stock valuation. The 134-year average P/E ratio is 16.7, whereas the current ratio is 25.9, or 55 percent overvalued. The ratio has only been this high on three other occasions: 1929, 1999, and 2007. Each time it happened, stocks dropped by over 50 percent, and didn’t recover for years. The Tobin Q ratio, which measures market value versus replacement cost, is considered one of the better long-term indicators of a pending market decline. 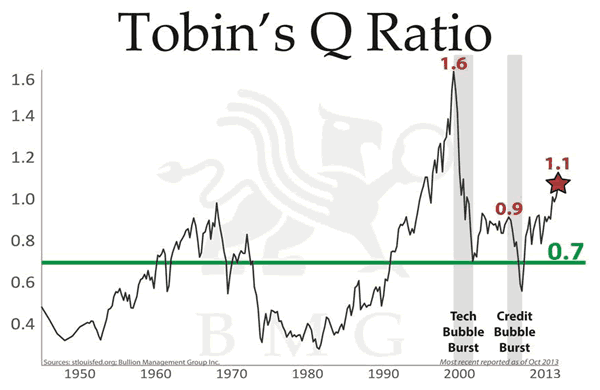 The current Tobin Q ratio exceeds the 70-year average of 0.7 by 58 percent. The ratio rose above the average in 2000 and 2008. This time, however, the correction could be much worse than in either 2000 or 2008. 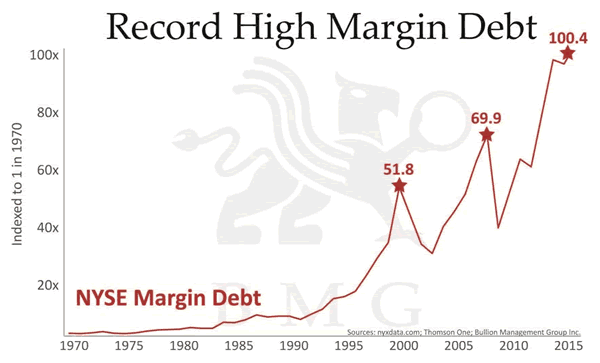 Not only do we have a significant overvaluation, but historically high margin debt will accelerate the decline due to margin calls. These conditions provide investors with the opportunity to sell high and take a profit. The “Buy Low” opportunity exists because gold has been in a cyclical correction for 3 years, and seems to have formed a bottom. Gold’s strong fundamentals point to a bright future; and of course gold has always protected portfolios during market declines. The future outlook for gold pricing is not complete without understanding the implications that China will have. China has been increasing its gold reserves, and has made a number of strategic moves that threaten the U.S. dollar’s reserve currency status. China has signed 26 currency swap agreements wherein the U.S. dollar is no longer used to settle trade imbalances. The Asian Infrastructure Investment Bank has been formed as an IMF alternative to provide loans to BRIC countries. A yuan currency exchange hub has been created in Canada with ICBC bank. China has developed an alternative to the SWIFT system of international currency transfers, and Russia is developing its own version. China’s currency has been accepted into the IMF’s SDR program, with full implementation in the fall of 2016, at a 10.92 allocation. The Shanghai Gold Fix, to be introduced in the spring of 2016, has a good chance of eliminating short selling on the COMEX because the Shanghai Gold Fix is going to be only physical, without any paper market dilution. If traders try to drive gold’s COMEX, price down through shorting, arbitrage traders in Shanghai will quickly counter the move. In 2015, the result of these changes was already showing, as 71 percent of U.S. Treasuries were purchased by the Federal Reserve with newly issued currency as demand for US dollars decreased.